surrounding the coral reef and to make the most of the warm climate and magnificent views of the vast ocean. The two parts of the Water Discus are connected by three or five solid legs and a shaft with lifts and stairways used to move between the two discs. The configuration of each Water Discus can be adjusted to suit local conditions and provide maximum safety and effect. 1) Training base for Special Forces units. 2) Maritime outpost to detect threats and protect selected areas. The volume of usable area of underwater and above water parts can be adapted to your needs. Water Discus object is the ideal base for organizing a center of science and maritime education in most coastal cities in the world. Instead of creating a virtual world in a concrete building on the land, you can use Water Discus technology, which offers interactive contact with the surrounding marine environment. Usable area discs and satellites in various variants can be adapted to local needs and equipped according to the planned research and educational processes. A sense of security is essential for good holiday and Water Discus Hotels have been designed to meet the highest safety standards. Safety was a top priority for both designers of the structure and a team of professionals who worked out the maintenance procedures. Our goal was to ensure that guests feel safe both inside and outside, while diving. The design, construction and technical condition of the complex are under permanent supervision of an international classification organisation with experience in the field of building and operation of boats, ships, offshore structures and professional diving systems. Water Discus meets safety standards as evidenced by class assigned and renewed periodically according to local law and requirements of international organisations. Our safety measures include a monitoring system integrated with an international earthquake and weather warning system. The hotel is monitored by numerous video cameras and remotely operated underwater vehicles which are positioned in appropriate places around the complex. The Water Discus complex was designed to ensure safety at all times, even in the most adverse weather conditions. 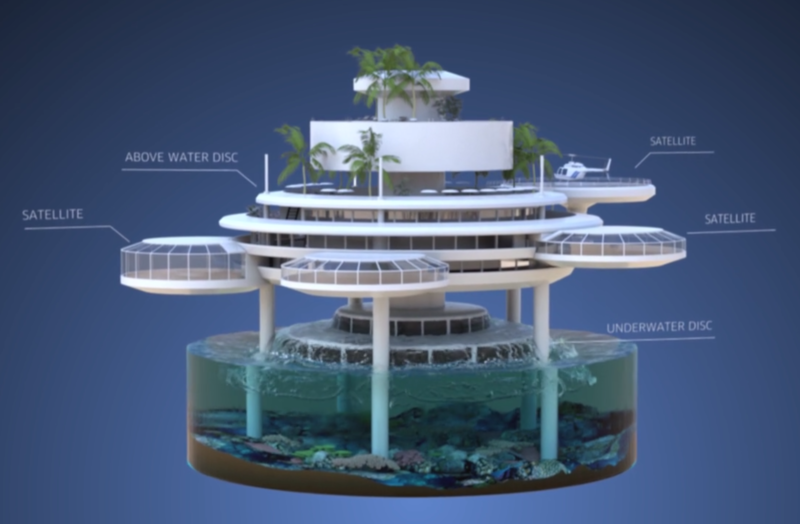 The structure sits up on five sturdy legs fixed to the seabed, and the upper disc is suspended above the water surface. These two technical solutions will ensure that Water Discus remains safe even in the event of a fairly high tsunami, which can normally flood the nearest coastal areas. You can truly enjoy your holiday only when there is a sense of security. Water Discus complies with the most stringent safety standards by, among other things, providing rescue equipment as prescribed by regulations applicable to vessels. In addition to this equipment, even if completely flooded, each of the satellite discs has positive buoyancy, which means that they can be used as lifesaving vessels after being detached from the main body of the upper disc. The sturdiness of the construction and technical solutions employed ensure that the underwater disc automatically surfaces at once in the event of any danger. 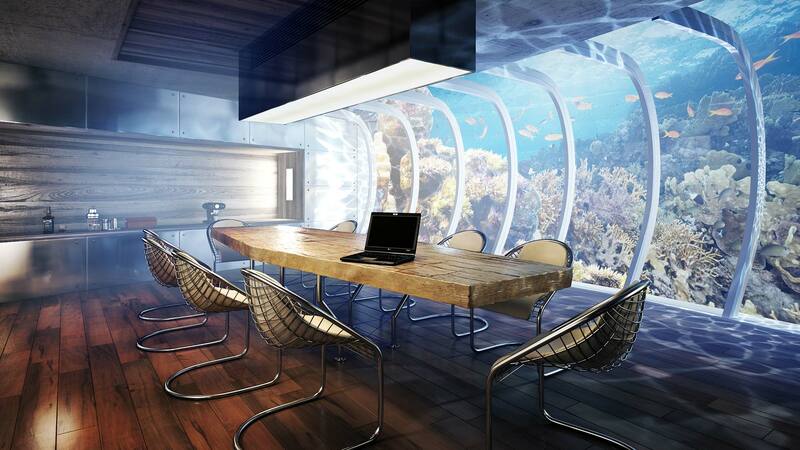 A wide shaft with a view of the sky above gives a safe sense of spaciousness, minimising any claustrophobic feelings some may experience while staying in an enclosed underwater space. of fabulously colourful fish, fascinating sea anemones, corals, starfish and sea horses. diving course or other special equipment to enjoy the beauty of the underwater world. 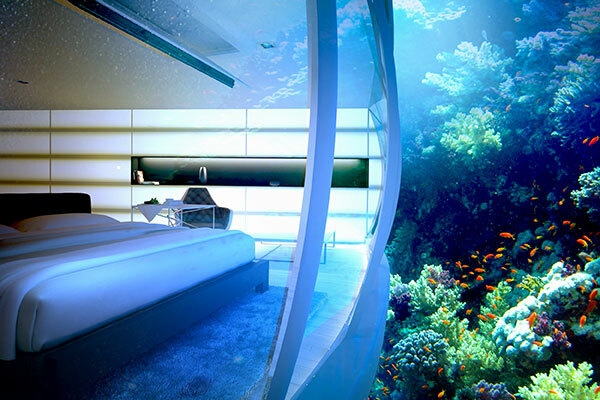 Water Discus Hotels comprise two discs – an underwater and above-water one. 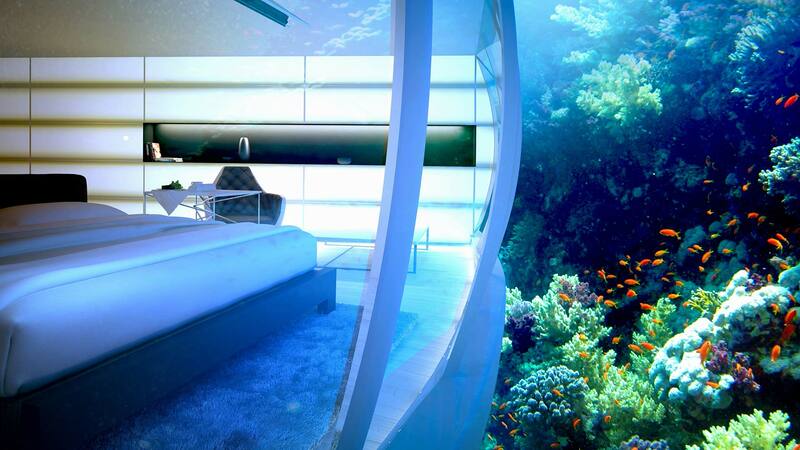 This combination will allow guests to admire the depths of the ocean while making the most of the warm climate. The two parts of the structure are connected by five solid legs and a vertical shaft containing a lift and stairway. The size of each disc has been adjusted to local conditions. 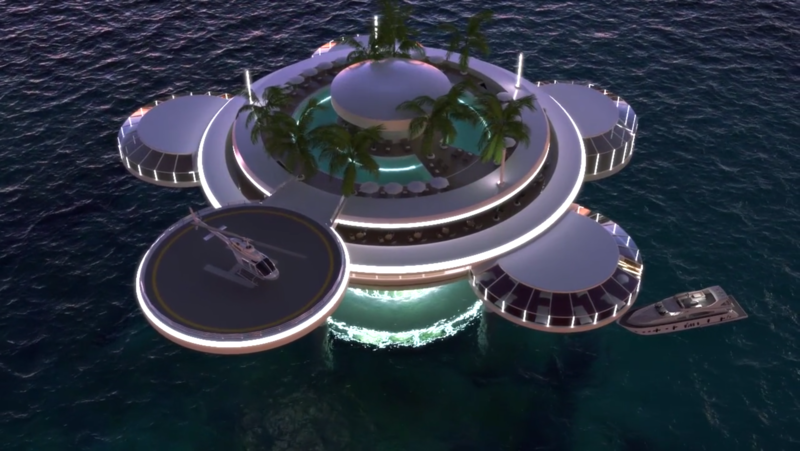 Due to its unique design, Water Discus can be expanded into a bigger resort complex. One of its most notable advantages is that it can be customised to suit the surroundings and the clients. A single Water Discus is an independent structure with a usable area of approximately 1000 m2 fully equipped to ensure a high level of safety and comfort. It can serve as an individual module – a component of a bigger complex. A number of such individual modules may be used to build a hotel complex of minimum 2000 m2, which can be further extended with additional modules (1000 – 1500 m2 each). 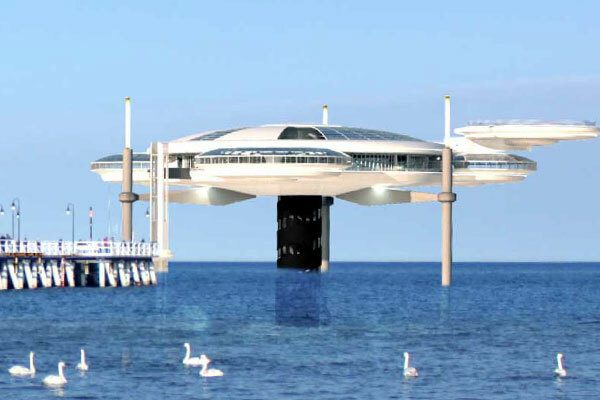 The disc and its adjacent satellites located 5 – 7 metres above the water surface comprise a restaurant, a spa and a special recreation area. A multifunctional lobby built inside an enormous swimming pool shows the centre of the disc. 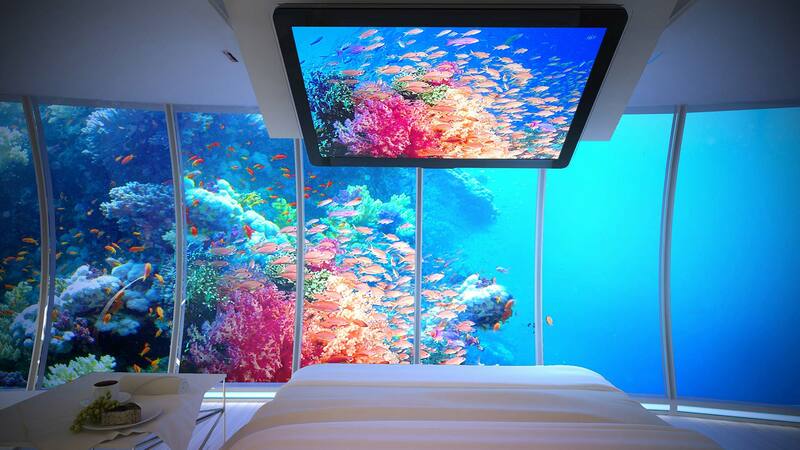 The area around the underwater part of the complex and diving activities may be watched as they happen on the screens hanging on the lobby walls. This part of the complex is connected to the satellites with awe-inspiring glass-walled tunnels cutting through a training pool for divers. Its rooftop includes seawater swimming pools (integrated with the training pool). Finally, there is also an exotic garden offering a moment’s rest before going back to extreme experiences. Water Discus makes diving among the colourful fish, sea anemones, reefs, rocks and wrecks illuminated by sunlight even more thrilling and unlike any other experience. This is because our dive centre is located underwater, adjacent to the residential area of the underwater disc. The centre is equipped with an underwater airlock, leading divers straight into the ocean without the necessity to come to the surface, and a decompression chamber for training purposes and deep-diving excursions. All equipment in this unique dive centre is there to be used by our guests. As a hotel which takes pride in offering marine adventures, we could not forget about various amenities for water sports. We will make sure that you will find everything for both beach-front and underwater activities. Our equipment includes, among many other things, 3-passenger submersibles for deep-sea exploration, motor boats for diving and water-skiing, fast jet skis and underwater scooters. Transport facilities were designed not only to support logistics but also to improve safety. The upper deck of the complex, for example, is connected to the shaft and can be used as a landing pad for helicopters, ensuring a quick and convenient transport. All rooms of the two discs have high-speed Internet access. 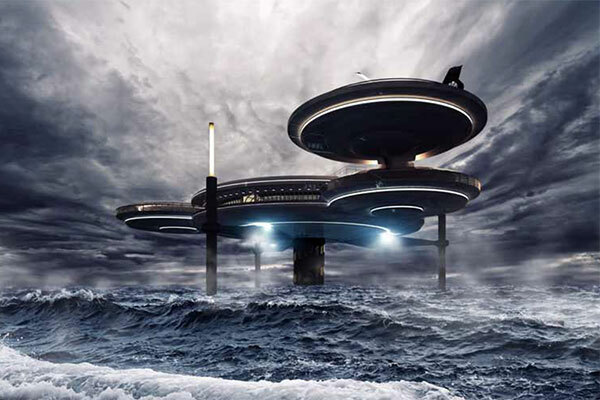 Additionally, in order to ensure that Water Discus remains in contact with the outside world at all times, the complex has been equipped with a ship radio station system and a satellite telephone.